This law will be implemented in the 2016-2017 school year. 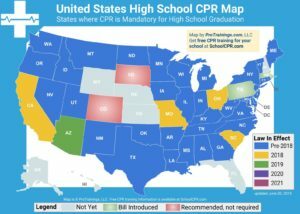 Public schools and public charter schools must provide CPR/AED training within a health class one time between grades 9 through 12. The training may be taught by video and incorporate a hands-on practice in addition to the cognitive learning. Must use an instructional program developed by a nationally recognized company and based on current national evidence-based emergency cardiovascular care guidelines for cardiopulmonary resuscitation. Teachers providing instruction do not have to be certified trainers. 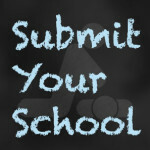 Students to do not need to earn a certification. resuscitation shall be included in at least one health class necessary for graduation. “(C) Incorporate hands-on practice in addition to cognitive learning. be provided by available community-based providers. a certified trainer of cardiopulmonary resuscitation. resuscitation to successfully complete the instruction for the purposes of this subsection.